Out in support of their stellar 2017 third album, I Used to Spend So Much Time Alone, Seattle’s Chastity Belt, who last made a Nashville stop with an appearance last summer at Drkmttr, return to Music City April 17 to headline The High Watt. Balancing a tongue-in-cheek sense of humor with earnest self-awareness, the indie group will be joined by Chicago punks Lala Lala and Memphis up and comers Harlan, for a stacked lineup of three must-know bands on the rise. Tickets are still available here, but we’re also giving away a pair of tickets to one lucky fan! Read on for more about the show and enter for a chance to win below. Formed in 2010 in Walla Walla, Washington (though now Seattle based), punk and pop tinged indie outfit Chastity Belt have quickly become a beloved fixture in the prominent pacific northwest scene. Like several of their Hardly Art labelmates (Tacocat in particular come to mind), the group find a nice balance between humor and social commentary, crafting smart, subversive, and occasionally quite earnest songs with breezy and hypnotic ease. Their latest and third LP, last year’s I Used to Spend So Much Time Alone is the band’s most personal, serious, and best yet, giving a better glimpse into their raw emotional state, without fully abandoning the fun and excitement of earlier efforts. A definite must-know band, it’s an especially cool time to jump on the Chastity Belt wagon, if you haven’t already, and the perfect time to see them live! Hailing from Chicago, indie punks Lala Lala (or La La La La, we’ve seen it written both ways), play a grungy, poppy style that compliments Chastity Belt, but also takes a more raw, lo-fi bent a la Girlpool or Frankie Cosmos. Their latest LP, Sleepyhead, arrived in 2016, and new music seems inevitable in the near future. Stay ahead of the curve though, and get acquainted with this excellent up and coming group now. Based in nearby Memphis, up and comers Harlan play a sort of jangly, lo-fi indie pop that feels like a perfect bridge between Chastity Belt and Lala Lala. Despite their close proximity, we’re embarrassed to admit we don’t know a ton about ’em, aside from the fact they’ve been churning out some impressive tracks over the past year, and seem well-suited for a night of feminist punk vibes and excellent music. Winner will be announced Thursday, April 12 at 5 p.m. CDT, and will receive one pair of tickets. Good luck! 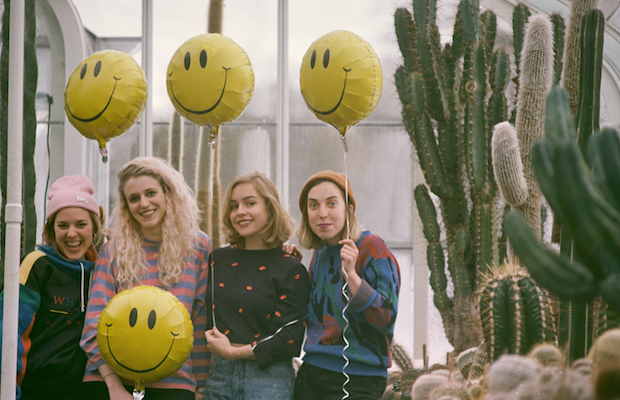 Win Tix to Chastity Belt at The High Watt! Chastity Belt, Lala Lala, and Harlan will perform Tuesday, April 17 at The High Watt. The show is 18+, begins at 7:30 p.m. (doors at 7 p.m.), and tickets are available to purchase for $12-15. Bonnaroo’s Roo Clue Number 7!